Entertainment should be one of the first items on your list to call after the hall has been booked. Usually, the first question I hear from a caller is How much do you charge? Probably the biggest mistake people make when hiring a DJ is choosing one based on price alone. Oddly, people seem to think all DJs are the same. As anyone will soon discover, this couldnt be farther from reality. As in any profession, DJs vary in knowledge, experience, and competence. Get some important information like: checking availability, ask the DJ to describe his or her service, references, experience, and what they have to offer you. Many professional DJs are booked 6 months to a year in advance. Problems arise because many publications tell future brides to select their entertainment 3 months prior to the wedding. By then, most people have spent a small fortune on the meal, cake, gown, tuxes, hall rental, photographer, flowers, bar etc. They tend to forget what can be the most important part of any successful reception, the emcee and the entertainment. Remember, when hiring a DJ you are hiring a "service" and you get what you pay for. Most often your entertainment costs between 2% to 10% of the actual total cost of the entire wedding! That's not a huge expense when you consider the Emcee / DJ is responsible for 80% of the success at the reception. Click for check list of the top 10 questions to ask! Lets talk real prices for a professional Disc Jockey. Prices may vary according to experience, reliability, equipment costs, music library, and what specific services each DJ is able to provide. The most expensive DJ is NOT necessarily the best. However the cheapest (least experienced) DJ is nearly always among the worst! Since each event is unique and different, there really is not a "set" price. Generally, for a private party, the price is around $125.00/hour for a four hour local event. Travel time is included in the price and of course, you don't pay for any of the time it takes to set up or take down, so you get four hours of entertainment. Our wedding reception prices start at around $750.00 for basic service. 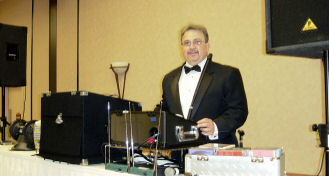 Additional sevices, such as music for the ceremony are resonably priced, to fit your budget. Again, additional hours for any event range from $60.00/hr. to $125.00/hr. Keep this in mind if you talk to a DJ who quotes $300 for a complete wedding. You may want to ask yourself, "Is this guy going to show up?" And if he does, will he be accompanied by a boom box, hand mike, and a stack of cassette tapes? Look for verified testimonials, ask to check references, look for professional affiliations. This is not the kind of service that should be outsourced to inexperienced wannabe's. Rest assured, we'll do our best to make sure your event is entertaining, affordable, and mounted by competent professionals. Being a competent DJ is more than just "playing disks." It means being skillfull as an entertainer and leader in social events. It is knowing how to select and use reliable equipment. It requires a huge investment in building a comprehensive music library. It means proficiency in good business and marketing skills and knowing how to deliver good value in service. Think about it this way; most people will hire a DJ once or maybe twice in their lifetime. Its important to understand you will get what you paid for. So be very careful when deciding upon your entertainment. You may like the price, but ultimately, the value of the happiness and good feelings your friends and guests will carry away with them from an evening well spent, is worth far more than an ephemeral "bargain" price. We are affordable, but not super cheap. After this many years in showbiz, we are definitely good at what we do.